Jami Attenberg's All Grown Up has been heralded as a much-needed addition to modern literature. The book's protagonist is a woman named Andrea who is nearing her 40s and is unmarried and without children. In the world of books, this makes her somewhat of a unique protagonist and readers are (rightly) clamoring to read more stories about women who make the choice to not marry or become mothers. But after reading this book, I wonder if this is really the story about singleness that we want. 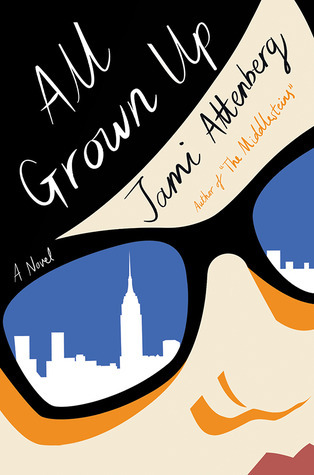 I will never dispute that Jami Attenberg is a deeply gifted writer. I greatly enjoyed her book Saint Maisie and the writing in All Grown Up is a pleasure to read. But if we are holding up the character of Andrea as symbolic of singleness, I find myself feeling very worried and a little sad. Andrea is a mess. The cover copy talks about the different perceptions of adulthood that everyone around her seems to hold; the problem is that Andrea seems to hold none at all. She is single not because she does not want to be in a long term relationship, but rather because she sabotages the ones she is in. She knows that she drinks too much and occasionally gives therapy a whirl, but seems to abandon it almost immediately. She hates her job, but does nothing to get a different one or even to find a hobby or activity that would give her some joy or sense or purpose. The buzz surrounding this book hails Andrea as someone who defies social expectations by choice. That is a book I want to read. But this story seems to be rather about a woman who is stuck and doesn't know what to do. She has no idea how to make a life for herself. She clings to her own mother, while ignoring or actively shunning her best friend and brother who have recently become parents. She regularly complains about, cancels plans with, or is cruel to the people in her life and then acts shocked when they don't make time for her in their lives. Andrea worries frequently that she's not grown-up because she hasn't checked off specific boxes in life. As a reader, the only way I wanted her to grow up was to learn how to better take care of herself and the people in her life. I wanted Andrea to be happy. I wanted her to make better choices when it came to her relationships with her family, friends, and lovers. I wanted her to find a job that didn't make her miserable and realize that she too was allowed to do things that made her feel fulfilled. Andrea used to be an artist and later in the book, she tell us why she abandoned it. I found myself wishing that someone had told her (and many other people) that loving art or music or acting doesn't mean you have to do those things professionally. There is room in life for things that just make us happy. Let's not hold Andrea Bern up as the single protagonist we've all been waiting for. I hope instead to read about characters who are making the choice to not get married or start families who are working towards goals, achieving amazing things, and learning about themselves and the world in which they live. I really enjoyed your comments on this one. I'd be inclined to agree. Not sure we want to hold up a female protagonist like this one as THE ONE. I think I'd enjoy the book you expected to the one you got too. Protagonists who make incomprehensible bad decisions are the worst.